The biggest game of the year so far has arrived, ending years of waiting and anticipation. Are the facial expressions really so groundbreaking? Does the game have a deep storyline and gameplay good enough to back up the realistic visuals? Read on to find out. 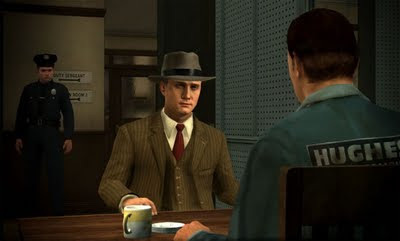 LA Noire puts you in the shoes of Cole Phelps, a World War 2 lieutenant that wants to make the streets of 1947 Los Angeles a safer place. Starting as a parole officer on the beat, you must solve increasingly difficult crimes, to rise through the ranks of the LAPD, and make a name for yourself. The story is one of blackmail, bribery and corruption, and Cole is not a man to leave a can of worms unopened. He wants justice and truth, no matter what the personal cost. Cole is not all perfect though, as one of his dark secrets is revealed through a series of flashbacks to the war. Only a small piece of information is given in each one, but they tell an amazing story. Don't use them as an excuse to fix yourself a drink, instead pay careful attention to every word, action and character. Subplots include serial killers and arsonists, to name a few. On top of that are the street crimes. 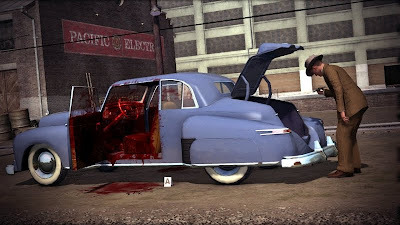 40 optional crimes that appear now and then on the mini map, which include negotiating with a suicidal jumper, chasing thieves and arresting bank robbers. Some of these do feel a bit too similar to one another, but they are optional so it isn't a big problem. As well as these street crimes, there are also a lot of things to collect. 50 film reels scattered around the world, which are very well hidden. Luckily, the Rockstar Social Club stat tracker is back. Even more detailed than the Red Dead Redemption one, it offers maps with locations of every collectable, let's you know your mission scores and overall percentage. It is invaluable if you want 100% completion. The main cases are much more fleshed out than the street crimes, usually involving a good few crime scenes, suspects and witnesses, and a lot of finding clues. Searching for all of the clues is the best way to make sure that you uncover all of the information. For example, finding a piece of evidence might unlock a new question for a suspect, but could easily be missed. This could lead to an incorrect accusation and your overall score could take a major hit. Once you get used to the mechanics of the game, finding clues is easy enough, and the game does give you musical cues, so you know whether or not to keep looking. The unique selling point of LA Noire is by all means the facial expression technology. Groundbreaking innovations mean that all of the faces in game are almost perfect copies of real life actors. Top of the range motion capture captures every twitch, every shifty look and nervous swallow. It has to be seen to be believed, and there is nothing like it. When you ask a question, you must carefully study their reaction, both physically and in what they say. If something doesn't add up, or if they look suspicious, you let them know and the information will come spilling out. This works by choosing one of three actions: Truth, Doubt and Lie. If they have a confident statute and voice, they are probably telling the truth. If they look away or shift uncomfortably, they are probably lying. Without solid proof though, you can only pressure them into folding by doubting their answer. If you think you have proof of lies, then show them the evidence and they have no alibi. It seems like a complex system to start with, but once you have tried a few interrogations, it becomes much easier. When you have a few crime scenes, you will have to travel between each one, and you can do this in a couple of ways. You can drive yourself, or your partner can drive. The latter is very much the same as the taxi feature in GTA IV. A fast travel system with some light conversation. Driving yourself is obviously more fun as you get used to the streets and find the best routes between different parts of the city. The only problem is, the driving is a little iffy. It lacks the weight that was oh so evident in each of the cars in GTA IV. The cars feel light, they move like F1 cars or go karts. The steering is incredibly sensitive and the cars whizz round corners with almost no problems. It may seem trivial but in an open world game, particularly one the size of LA Noire, driving is a huge part of the experience and it needs to be good. Once you have played a few cases (there are around 20 overall), you will be used to the driving, interrogations and finding clues. You will know how the cases seem to work, and unfortunately, the main structure of each case does not change much for the rest of the game. There are new mechanics added now and then which are specific to the cases that they are in, but they are sparse and usually not very long. It is a case of the gameplay being sacrificed in favour of the overall experience. In any other game, this would be a bad thing, but with LA Noire, it just isn't. The game is the first step towards videogames being recognized as a credible form of adult, intelligent entertainment. The technology is amazing, and the game will no doubt be remembered as an industry changer. Try to play the game and not be drawn in, to the most realistic and immersive game that the world has ever seen. In terms of gameplay, it has some issues, but in terms of entertainment, it has none. The characters are fleshed out, with backstories and flaws, the world is a beautiful, accurate and loyal recreation of LA and the emotions are so evident and powerful. Miss this for nothing.